Does your baby have a craving for yummy avocados? New research shows that that's the best possible food they could crave! Learn why here! According to a new study, the neutral flavour, soft consistency and nutrient density make avocados the ideal first food for babies. The study claims that avocados can help boost infants' growth and development. "Infants should consume moderately energy-dense foods that are low in sugar and rich in multiple nutrients," says the new paper published in the journal Nutrients. Ideally, a baby's first food should have a low to moderate sweet and salty flavor. This helps babies to avoid early preferences for sweet foods at such a young age. The neutral flavor of avocados helps make it a practical food for a first food. In addition to their flavoring, avocados are unique among complementary and transitional foods. They can provide babies with an ideal source of calories to meet the increasing energy and growth demands associated with growing toddlers and weaning infants. Robert Murray, Professor at the Ohio State University, claims, "It's important that infants experience a wide variety of tastes, textures, colors and combinations, in their first foods." When analyzing the nutritional facts of an avocado, it's easy to see why researchers praise the fruit. If you want your baby to have little exposure to sugar (natural or otherwise), an avocado is a very viable option. Avocados contain less than 1 gram of sugar per serving (0.09g). That's the least amount of sugar per serving of any other fruit. Learn more about this baby superfood! Visit the next page to check out more from this new study! Another quality of an avocado that makes it perfect for babies is it's unique texture. Avocados' soft and smooth textures can help infants to develop the ability to chew and swallow with no worries at all. They also open the door to a wide variety of eating for your child, as they'll be familiar with unique textures and flavors--courtesy of avocados. 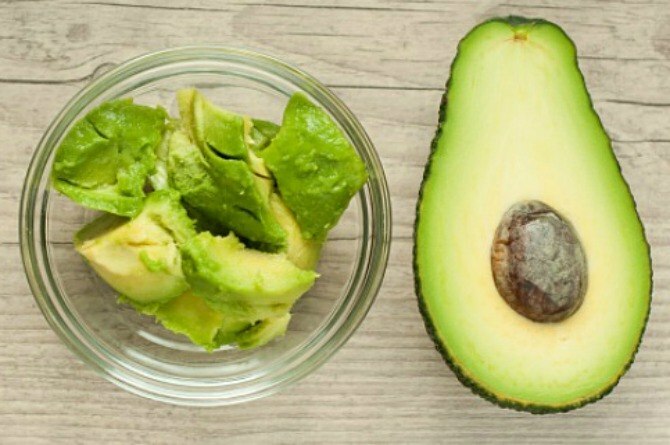 The researchers of this study also noted that avocados help significantly enhance the absorption of lipid-soluble vitamins from foods eaten with them. In short, the benefits of avocados are nearly unmatched. Their texture, flavor, and nutrients are the perfect fit for your first time eater and they can benefit and stimulate your child's development and growth! Looks like baby's having avocados for lunch! READ: Are you eating the right snacks for your body type?